Set in science fiction realities, an MMO simulator developed by Crowd Control Productions from Iceland. The action of EVE Online takes place in a universe called New Eden, which consists of over 5,000 star systems. 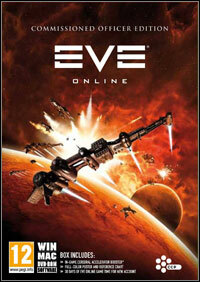 publisher : Simon & Schuster Inc.
EVE Online released on PC is an MMO developed by Icelandic CCP studio. The game was published in 2003 and over the years has significantly changed. The action takes place in the virtual universe called New Eden composed of more than 5,000 solar systems. On a deck of your spaceship you travel in order to fight, trade, complete quests, get involved in corporate politics, or just simply to develop your character. The production features a monthly subscription model. Each player gets to create his own avatar with the use of an extensive editor. You shape not only the external appearance and outfit, but also the race and origin. At the beginning you are presented with a poor spaceship and few credits and from now on you can travel wherever you want and take up different activities. There are training missions and tutorials for beginners and a special discussion channel with administrators. EVE Online features an in-game encyclopaedia devoted to different aspects of the game. Character development in EVE Online for PC is quite peculiar - instead of gaining experience points, which is typical for MMO games, you teach your character new skills. Many of them, like navigation, guarantee overall benefits. Due to the implementation of 24-hours skill training queue, the process of learning is continued even after leaving the server. Of course, a well-developed character needs a decent vessel – the title features dozens of them. They are divided into types, sizes, and destinations. Each of them requires modules improving performance, shields, and weaponry. Implementation of almost every new technology means the necessity of learning a new set of corresponding skills. The production by CCP enables the player to develop the character in a few directions and to choose different playing styles. For example, players can engage in trade and transport wares from station to station, extract resources, produce technology, or focus on military missions. It is worth mentioning that almost every item in EVE is crafted by the players. Courier, mining, or military missions are given by NPCs representing big corporations. If you successfully complete your quests, you are awarded not only with credits, but also with reputation points, which reflect your status in fractions. The more trust you earn, the better paid and more difficult missions you get. EVE Online will not bore you, as creators add new missions and challenges systematically - raids of fleet led by Sansha Kuvakei serve as a great example. More advanced players can set up their own organisations – corporations and alliances – and thanks to that they can complete more difficult quests. Such activities even have dedicated special character skills. The existence of an astonishing number of PvE activities does not mean that there are no PvP elements. Contrary to what one may think, it focuses on waging wars and battles, which later in the game turn out to be the main course. Around a small, peaceful centre, there is a wide stretch of low-security systems where players constantly fight in the PvP mode. EVE Online for PC features good quality audio-visuals and offers a number of built-in extras, like a music player, a mail system, and an Internet browser. The production is different from other MMO games, which usually are divided into servers/worlds – the virtual space is big enough for everyone, so there are tens of thousands of players visiting it at the same time. The community of players, who create their own portals supporting the game or even radio stations, is also a valuable asset. Game score 8.8 / 10 calculated out of 1905 players' votes.